Visit the official website for NIIT University, Alwar admissions 2019. Click on "Apply Now" to be redirected to the Login page. After logging in, the Application Form will appear. Select the desired course & click on the 'Admission Process'. Collect the application form from the Admission office of the University. 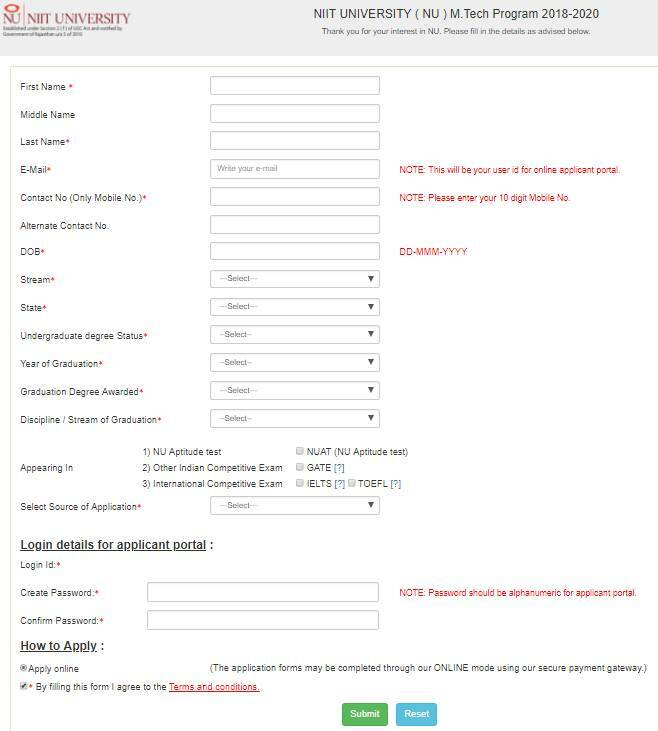 Pay the Application Fee by Cheque/ Demand Draft, drawn in favour of NIIT University, payable at Delhi/Gurugram. 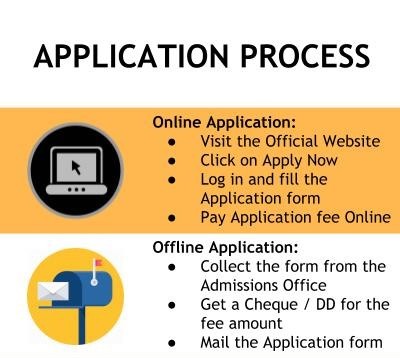 Mail a copy of Application form to "admissions@niituniversity.in"
Courier/ Post the printed copy of the form by post to the NU Central Admissions Office at NIIT House, 85, Sector 32, Institutional Area, Gurugram, Haryana – 122001. The applicant will be selected on the basis of the merit & their performance in the respective entrance exam. M.Sc admissions are done on the basis of marks in the previous qualifying exam and NIIT University Engineering Test [NUET] or equivalent. Admission based on Graduation marks and work experience of the candidate. Admission is based on the 10+2 marks and scores in JEE Main / BITSAT / SAT / NEET or the NIIT University Engineering Test (NUET). Minimum of 60% aggregate in 10th with compulsory subjects - English, Mathematics, Science and Social Studies level and 10+2 level compulsory subjects to apply for NIIT University admission 2019. English from CBSE/ ICSE or any other board in India or an equivalent board if from a country outside India in any stream. Valid scores in JEE Main / BITSAT / SAT / NEET or the NIIT University Engineering Test (NUET). The minimum requirement is a 60% aggregate at the 10th and 10+2 level with compulsory subjects Physics, Chemistry, Mathematics or Biology [PCM/ PCB] & English from CBSE/ ICSE/ any other board in India. 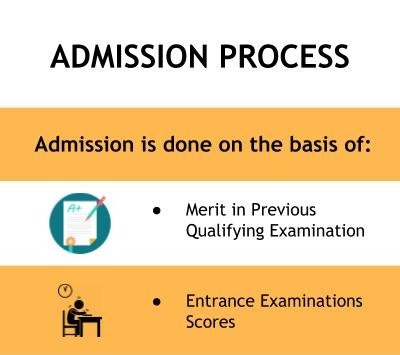 The candidate should have a minimum of 60% aggregate in 10th with compulsory subjects - English, Mathematics, Science and Social Studies level and 10+2 level compulsory subjects to apply for NIIT University admission 2019. Must score at least Grade 4 in IB Board or minimum Grade C in Cambridge IGCSE Board. Candidates should have valid scores in JEE Main / BITSAT / SAT / NEET or the NIIT University Engineering Test (NUET). Minimum of 60% aggregate at the 10 level and 10+2 level with compulsory subjects Physics, Chemistry, Mathematics or Biology [PCM/ PCB] & English from CBSE/ ICSE/ any other board in India. Those who scored first class in any two exams among 10, 12 & Graduation and second class in the third exam can apply for this programme at NIIT University. Working professionally with minimum 3 years of work experience with a minimum of 50% aggregate in 10, 12 and graduation will secure admission for the candidate. The candidate should have passed 10th standard with minimum 50% marks and compulsory subjects like English, Mathematics, Science and Social Studies to apply for NIIT University, Alwar admission. He/ She should have passed 10+2 standard with minimum 50% marks and English as a compulsory subject to any stream. Minimum of 50% aggregate in 12th in Science/ Commerce/ Humanities and must have scored at least Grade 3 in IB Board or minimum Grade D in Cambridge IGCSE Board.